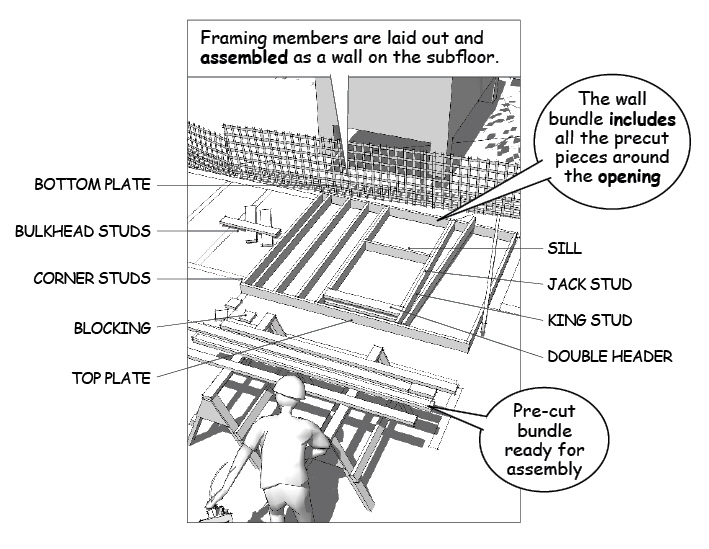 The wall layouts follow the floor plan for the building’s design, but the overall dimensions of the framing as well as the framing members themselves are determined in the field by the framing crew doing the work. 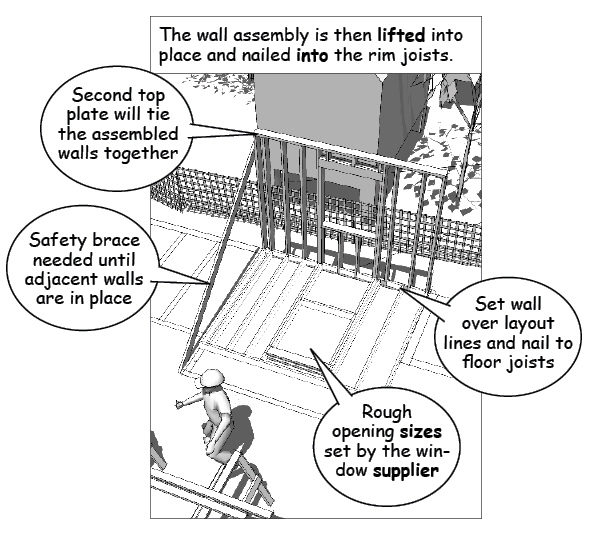 The construction method varies with the wall’s location, the size of the job, and the structural requirements. A full framing team is made up of a lead carpenter, framers, and at least one carpenter in charge of the actual cutting. The lead carpenter sets the layout and sequence of wall construction and the framers determine the cut lengths for the assembly as they erect the walls. 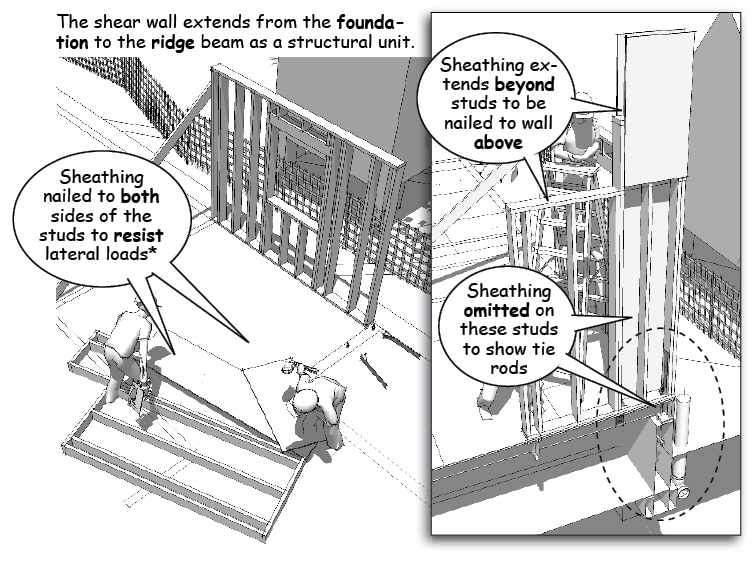 Lengths are either called immediately to a cutter as the wall is being assembled or listed on a cut-sheet so the pieces can be prefabricated as separate bundles. The pieces in each bundle are then marked for assembly and staged on the subflooring for different crews. The idea is to safely separate the work, allowing skilled carpenters to check dimensions and fit the members together as each wall is put into position. Once the wall is assembled, it is tilted up and moved into place over the layout lines marked on the subfloor. The bottom plate is then nailed or bolted through the subfloor into the top of the floor joists. 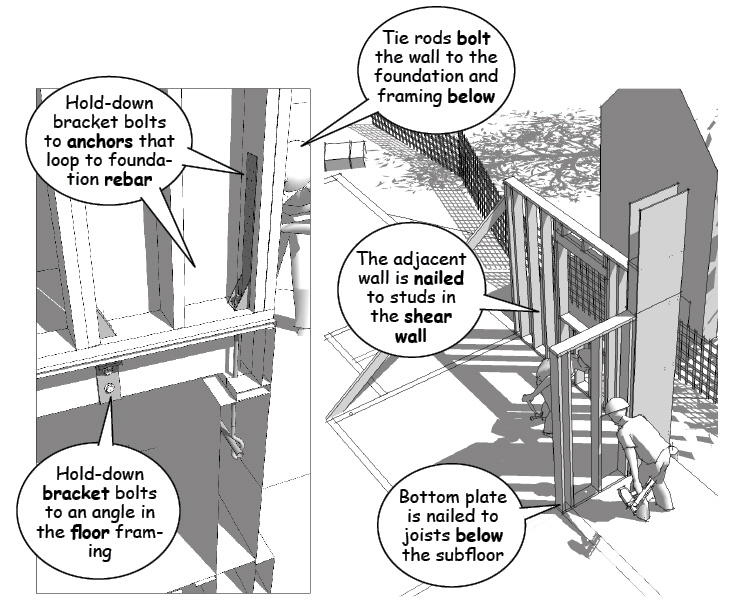 When regional wind or earthquake loads require special engineering, the shear walls are designed so that tie down anchors extend down to the floor framing to be bolted to the foundation. The shear walls also extend up from the foundation as part of the wall framing to be tied into the roof framing. In this way, the entire structure acts as a unified structural element. For this reason, the size and spacing of the nails securing the panels to the studs is critical to transferring lateral stiffness of the wall from the foundation to the roof.